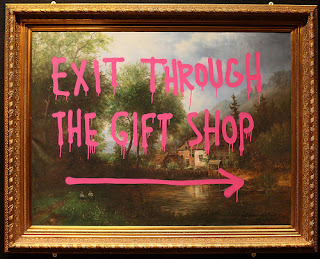 Exit Through the Gift Shop, the Banksy documentary nominated for an Oscar, made me cackle and left me scratching my head a bit. Rarely does a documentary make me laugh out loud (could be my taste in docs), but this one was a lot of fun. I love love love clever street art. One of my favorites right now is Joshua Allen Harris. Check out this video. Loved this one too- interested to see how the whole Banksy thing plays out at the Oscars tonight. Watched "Cropsy" Friday night- holy cow! Interesting take on media manipulation (I could say this guy killed a whole bunch of kids- oh yeah, I can see that, or I could say he saved a bunch of people from a burning building, oh yeah, I can see that). In the end, I really don't know if he did it or not. But also interesting, like you said, to see inside Willowbrook. Reminds me of loads of stuff I read about when I was waaaaay into "Weird NJ."